Sure, different cuisines are bound to hold certain ingredients in higher regard over others. The Kanaks in New Caledonia might, however, be the prize-winners when it comes to their celebration of the yam. Whether in traditional dishes like bougna or even full-fledged festivals, it’s apparent that the yam has a special place in these Melanesian cuisines. Before delving into the actual festival of the yam, it’s helpful to understand a bit of who exactly lives in New Caledonia. There are two main ethnic groupings on the islands within the archipelago of New Caledonia. There are the Kanaks, and there are the Caldoches. Between the two, 80% of the New Caledonian population is accounted for. The Caldoches, sometimes also called Caledonians, refer to those living on the island from European descent. Up until the late 18th century, New Caledonia – and thereby the term “Caledonian” – didn’t even exist. Up until that point, the islands were inhabited by a loosely affiliated (if at all) indigenous tribes that had little to do with one another. It was only with the arrival of European explorers, starting with the British explorer James Cook in 1774, that the islands became geopolitically associated. As a bit of a fun fact, it was Cook that named the archipelago New Caledonia because the northern part of the main island reminded him of Scotland. The arrival of Cook signaled the beginning of a pivotal period in the history of the islands, as more European explorers soon landed ashore and began the typical infighting as to which European power these new lands should be colonized by. Eventually, the French “won” and colonized New Caledonia, but the course of a tumultuous two centuries that included spells of slavery and ethnic clashes, there was hardly any cultural assimilation between the Europeans and the indigenous peoples. Technically, the term “Kanak” serves as an umbrella term for a whole host of various ethnic groups, although it’s thought that most of these groups share a similar ethnic ancestry that traces back to original Lapita inhabitants. Still, there are 28 formally recognized “Kanak” languages and it’s a term that came via the European explorers as well (kanak is originally a Hawaiian term). Nevertheless, there has been a growing sense of collective Kanak identity over the years especially in the times going up against French colonialists. At its core, to be a Kanak implies that you descend from the original indigenous peoples of the New Caledonian archipelago, and while more than 2/3 of the overall population live around the capital of Noumea nowadays, most of those who live elsewhere are of Kanak descent. Generally, the Kanak are very spiritual and retain a lot of traditions and practices in celebration of the gifts that the natural world provides them. The sea, for example, is considered to be highly revered because of all the fish and food that it provides. In gratitude, there are many unofficial oral laws and practices that pertain to protection and conservation of the ocean’s biodiversity, and these laws are taken very seriously in the Kanak communities. There are also a fair amount of land-based celebrations, one of which we found particularly relevant to the prevalence of bougna. 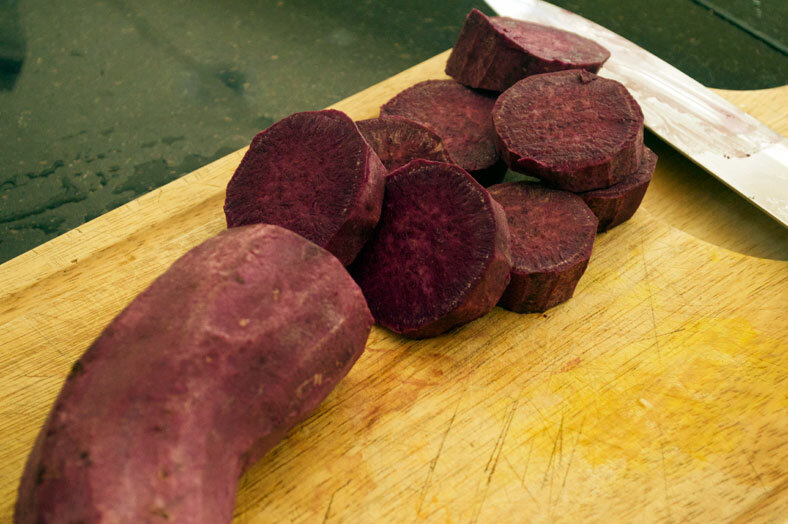 Yes, we’re talking about the festival of the yam. For whatever reason, domestic horticulture didn’t catch on in the New Caledonian islands quite like it did in other Pacific nations. 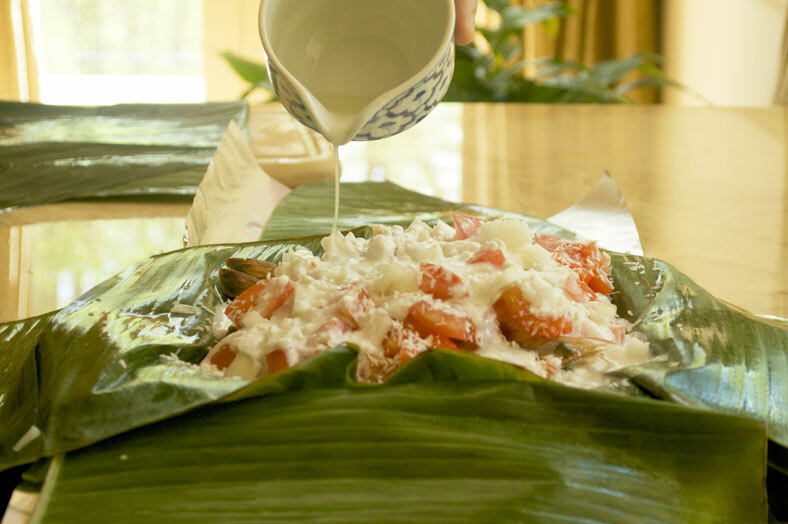 As a result, instead of a cuisine featuring fresh tropical fruits like you might expect, the Kanak cuisine is one more reliant on seafood and root vegetables like taro and yam. For the yam in particular, the vegetable is held in incredibly high regard. Many Kanaks consider the yam to be a sacred gift from nature, and it is a prominent feature of many various ceremonies. If you’ve got a wedding or a baby shower coming up in New Caledonia, for example, chances are that you’ll have yam-filled dishes aplenty. The Kanaks have a festival dedicated to the yam itself as well. At the beginning of the yam harvest, younger Kanaks will pull yams from the ground and, as a sign of respect, present them to the elder clansmen and tribal chiefs. During this festival, the yams are then blessed by the local priest before being distributed out through the rest of the community. Nowadays, the Festival of the Yam includes carnivals, concerts and dancing as well, and it’s considered one of the most celebrated times of the Kanak calendar. Which brings us to one of the main yam-rich dishes: bougna. 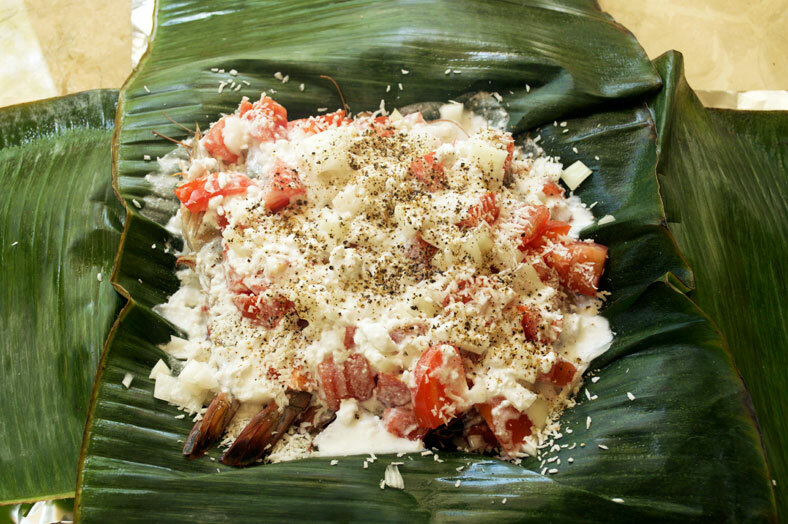 When prepared in the most traditional sense, bougna combines many of the key staples of Kanak cuisine: the banana leaf, root vegetables, and the “earth oven.” More often than not, there will also be a corresponding protein like fish or chicken added to the bougna, but there’s less consistency in this area than the others. The word bougna comes from the Drehu language (one of the “Kanak 28”) and can be translated into English as “bundle” or “pack,” so the name itself gives you a sense of how this recipe is generally prepared. If you happen to have an earth oven laying around – we didn’t, which is why our recipe is adjusted – then putting together your bougna is fairly straightforwards. 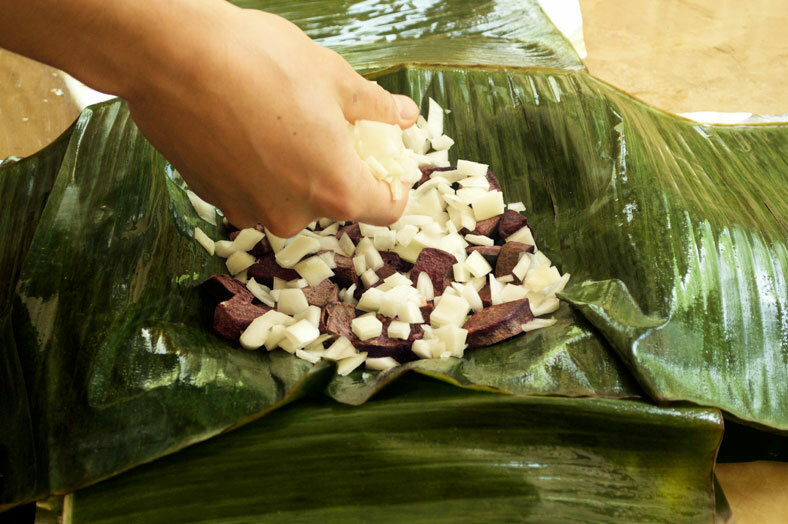 You’ll start with a bed of banana leaves into which you’ll first layer your yams and other root vegetables as you like. It’s very common to have yams, taro and sweet potato in here, for example. From there, you can add additional ingredients like onions, garlic, tomatoes and sometimes even bananas. These tend to go on top of your bed of root vegetables followed by grated coconut and your protein of choice. Chicken and/or fish are the most common proteins used for bougna, but again you can really use anything you prefer. 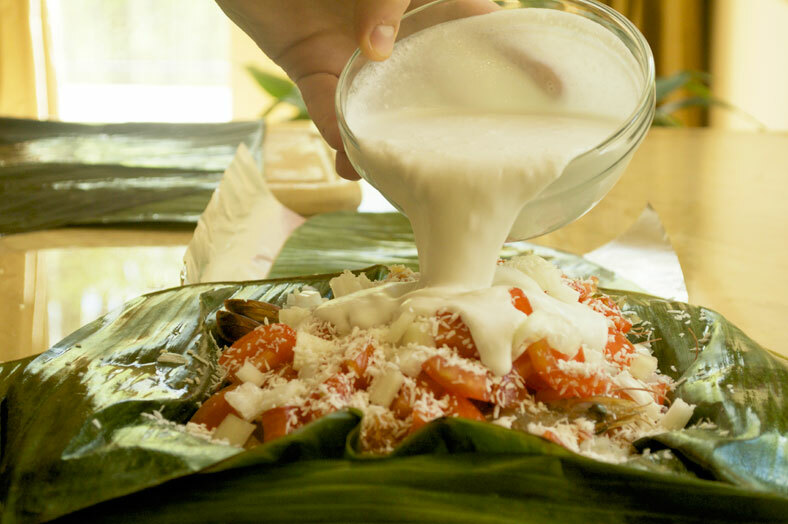 With all your ingredients layered together, you pour your fresh lime juice and coconut milk over the ingredients and allow a stew to collect and create at the bottom of your banana leaf bed. This boiling in the coconut milk yields especially delicious results for your root vegetables. 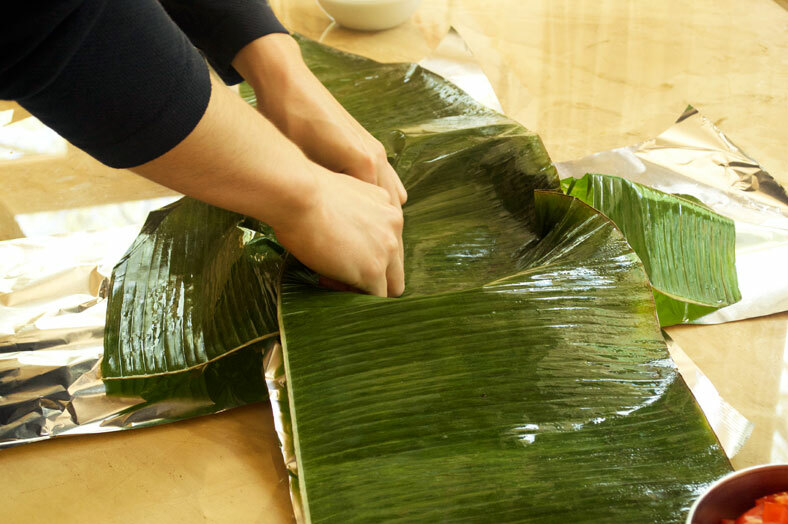 Finally, you’ll wrap the banana leaves around the entire ensemble and place into the oven. The most traditional way would be to cook in the earth oven – a practice very common in New Caledonia and other Pacific islands – although you can very well bake your bougna in an oven as well. In the next section, we’ll explain how we did that. We loved everything about this dish when we first encountered it, but we were admittedly a little put off by the earth oven requirement. 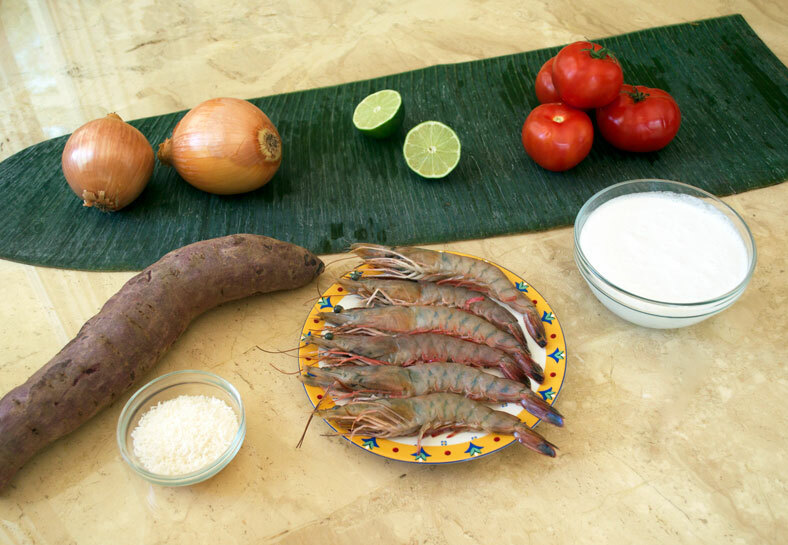 It was our goal for this post, therefore, to try and make this delectable yam and seafood dish accessible for more everyday consumption, particularly to those out there without a massive fire pit laying in their backyard. Starting with a truly traditional and delightful looking reference recipe, we made a few adjustments to make the bougna a little more feasible. Most obviously, we made our bougna with the use of your everyday oven. Because the heat from the oven can be sometimes hotter and more consistent than what an earth oven might yield, this actually helps cut the overall cooking time for the bougna down. 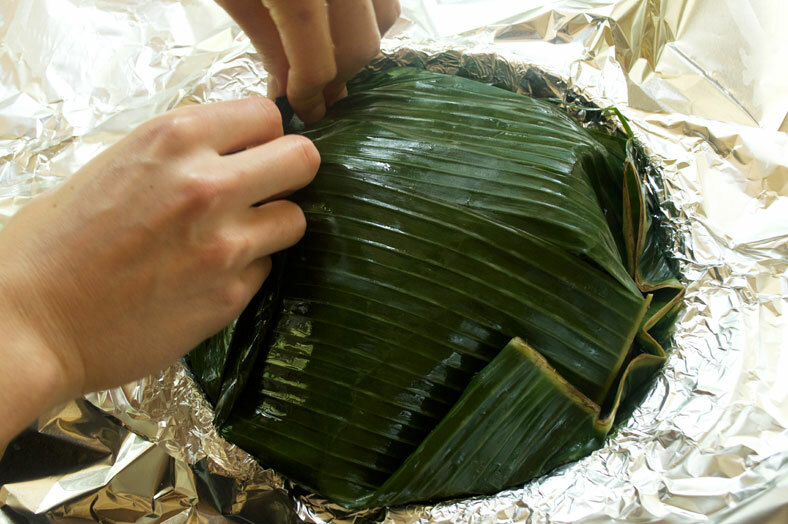 From there, we leveraged both banana leaf and aluminum foil for our bougna. 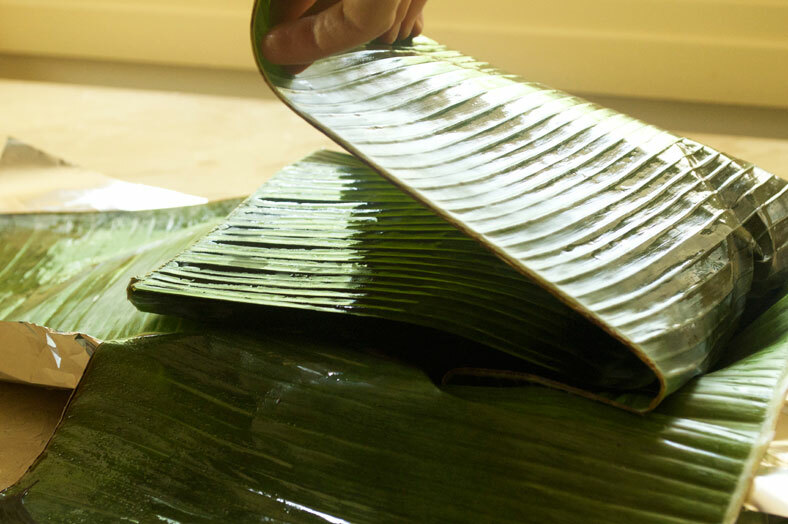 The banana leaf does impart some valuable oils and flavors into the bougna itself, although it is by no means a requirement if you cannot find any nearby. 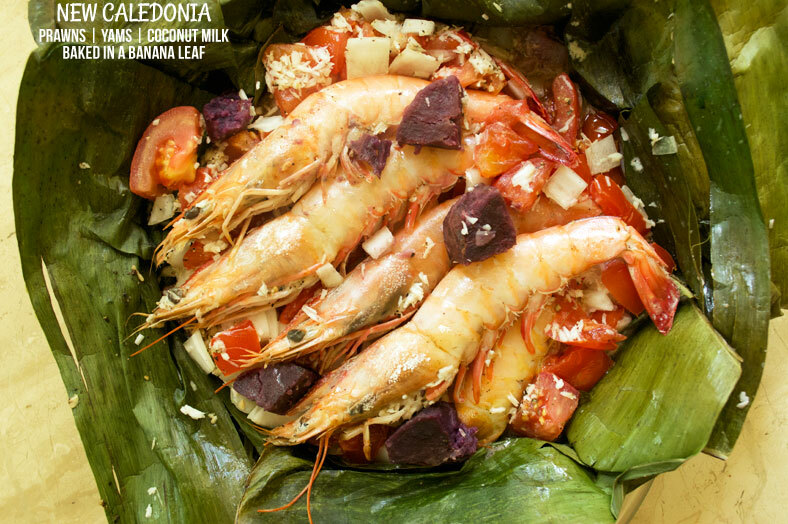 In this case, you can consider the banana leaf an ancestor to aluminum foil and make your bougna with a 1:1 substitution. In our case, though, we were fortunate to find some banana leaves near us, so we went ahead and used it along with the extra support of aluminum foil to ensure the bougna was tightly sealed. For ingredients, we actually made a swap in the protein used. 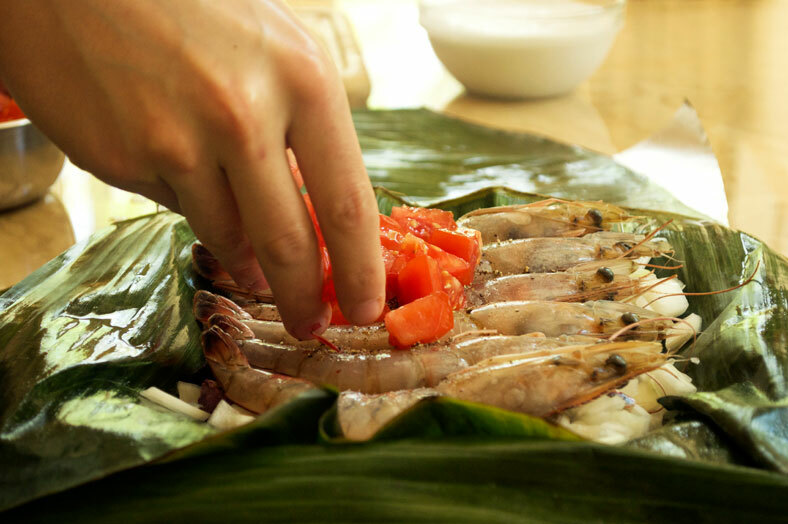 Instead of fish, we really enjoyed making the bougna with prawns instead. We also cut down the amount of root vegetables in there, and instead made it a dish that featured the yam above everything else. Adding a touch of lime juice and green onions also gave the recipe a delightful je ne sais quoi, but it was very good indeed. The recipe is incredibly simple especially when making it in a conventional oven! Between the yam, the coconut, and the seafood flavors, you get a wide variety of textures and flavors that make this dish truly special. Besides yam, what would you put in your bougna? Comment below! 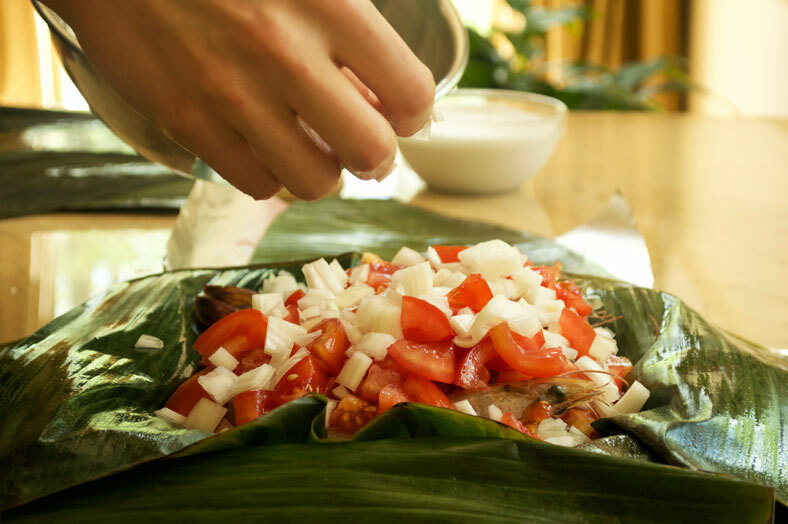 After 12 minutes, remove and add it to the rest of your ingredients and the "Bougna assembly line"
Stage 2 - Prepare your Bougna "Assembly Line"
After 45 minutes, unwrap your banana leaves and/or aluminum foil, and enjoy!